Electric Massage Chairs in New Caney TX - Visit Our Electric Massage Chair Showroom Today! Are you wondering where to buy electric massage chairs in New Caney TX? E Care Medical Supplies have a wide selection of electric massage chairs at the best prices our the local showroom store in Houston TX. Step into the realm of relaxation and comfortable living by experiencing one of our top of the line massage chairs. An electric massage chair would be a welcome addition to your home. We allow you to test out our massage chairs you like in order to determine if it is the right model for your needs. 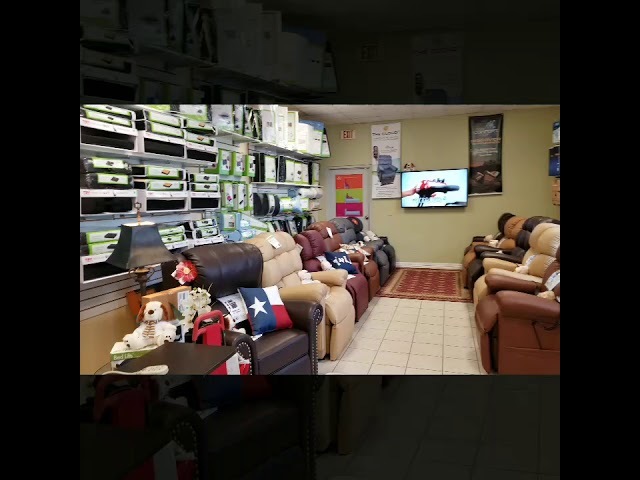 Stop by to our massage chair store on 4306 Fulton St in Houston TX and try our large selection of massage chairs in our showroom today!. We can delivery our electric massage chairs to your home or facility! We proudly delivery our electric massage chairs to the Houston area and the following Texas Cities: Alief, Alvin, Austin, Bacliff, Bay City, Baytown, Beasley, Beaumont, Bellaire, Bellville, Brazoria, Brookshire, Buna, Channelview, Cleveland, College Station, Columbus, Conroe, Corrigan, Crosby, Cypress, Dayton, Deer Park, Dickinson, Freeport, Fresno, Friendswood, Fulshear, Galena Park, Galveston, Giddings, Gonzales, Hempstead, Highlands, Hitcock, Hockley, Houston, Huffman, Humble, Hungerford, Huntsville, Katy, Kemah, Kendleton, Kingwood, La Grange, La Marque, La Porte, League City, Liberty, Livingston, Lufkin, Magnolia, Manvel, Missouri City, Mont Belvieu, Montgomery, Navasota, Needville, New Caney, New Waverly, Orchard, Pasadena, Pattison, Pearland, Pinehurst, Plantersville, Porter, Prairie View, Richards, Richmond, Rosenberg, San Antonio, San Felipe, Schulenburg, Seabrook, Sealy, Silsbee, Simonton, South Houston, Splendora, Spring, Stafford, Sugar Land, Sweeny, Texas City, The Woodlands, Thompsons, Tiki Island, Tomball, Victoria, Waller, Wallis, Webster, West Columbia, Willis, Woodville, and much more! We also offer medical equipment rentals on Couch Canes, Recliner Lift Chairs, and much more! Zero Gravity Design Foot roller S-Track Movabel Intelligent Massage Robot Six Unique Auto-programs 6 Massage Styles 5 Levels of Speed Intensity Calf Rest can be Lifted and Stretched Auto Timer 5-30 Options Hip Air Massage Vibration Seat Massage Shoulder Air Massage Available Colors Black Brown Charcoal Cream S-Track Movement - S-track roller movement is designed with the shape and curvature of the human spine in mind. It provides support to the neck and back especially the lumbar area so to increase the effects of the massage. Zero Gravity - The zero gravity position is a relaxing and stress-free position on your body minimizing the pressure along the back and spine region. When reclined into the zero gravity position the complete weight of your back is virtually supported by the backrest which maximizes the intensity of the massage. Features Computer Body Scan Equipped with the latest technology it allows for the rollers to map the back curvature with even more accuracy which translates into a more precise massage hitting all the key areas. Regardless of your body type this highly advanced chair will self- adjust making each massage experience feel customized. Unique Foot Roller Located on the bottom of the feet are 2 rows of spinning reflexology massagers which provide a soothing kneading style application. As the rollers spin it will stimulate acupuncture points and as the air bags inflate it will generate a much deeper massage along the bottoms of your feet. Zero Gravity Massage Inspired by NASA technology the Zero gravity position is the perfect position to enjoy a massage aligning your back relative to your thigh at an optimal level of comfort. When reclined into the zero gravity position the complete weight of your back is virtually supported by the backrest which maximizes the intensity of the massage. This feature improves spinal decompression and decreases muscle tension of the spine. There are 2 stages of zero gravity the 2nd being more reclined. When reclined fully to where your legs are higher than your heart level the therapeutic effects are incredibly effective and may be felt immediately. Next Generation Air Massage Technology Osaki OS-4000T has re-engineered and has developed the next generation of air massage technology streamlining the air massager to a lower count. Through innovative engineering we have reduced the total number of air bags but have increased the volume and surface area of massage. By doing so the total number of working valves has drastically reduced from prior model. Which ultimately puts less stress on the chair making it one of the most mechanically sound massage chairs in the market. and more.... see below Why Buy a Massage Chair Your Investment with Great Returns - Buying a massage chair seems to be a big purchase at first but consider the expense your time and efforts taking trips to massage therapists. You can enjoy a massage right at your place when you have spare time. Therefore with the help from us at Titan Chair we will make sure you choose the correct massage chair. Your Convenience Health and Well-being - With high quality massage chairs your body will be better relaxed and be much healthier. Many people testify some of their chronic symptoms or pains are decreased after experiencing a high quality massage chair. Also many chiropractors are recommending a quality massage chair for back pain loosening muscles and restoring its natural posture. The Osaki TP-8500 massage chair utilizes some of the latest technologies in massage chairs such as L track design and next generation airbags. The L Track allows the massage rollers to not only massage your back but also your gluts and back of your thighs. Add the next generation airbags with the quad head L track massage roller for an amazing massage that will keep you coming back for more. L-Track Massage Function Zero Gravity Computer Body Scan Ankle Knobs 5 Preset Programs Heat Full Range Foot Rollers Space Saving Chair Available Colors Black Brown Beige L-Track Movement - In the L-track roller movement rollers starts in your neck area and follow the full extension until the buttocks. This function increases the effects of massage as it enables each disc of your spine to individually separate and decompress allowing nutrients to enter disc tissue. Zero Gravity - The zero gravity position is a relaxing and stress-free position on your body minimizing the pressure along the back and spine region. When reclined into the zero gravity position the complete weight of your back is virtually supported by the backrest which maximizes the intensity of the massage. Why Buy a Massage Chair Your Investment with Great Returns - Buying a massage chair seems to be a big purchase at first but consider the expense your time and efforts taking trips to massage therapists. You can enjoy a massage right at your place when you have spare time. Therefore with the help from us at Titan Chair we will make sure you choose the correct massage chair. Your Convenience Health and Well-being - With high quality massage chairs your body will be better relaxed and be much healthier. Many people testify some of their chronic symptoms or pains are decreased after experiencing a high quality massage chair. Also many chiropractors are recommending a quality massage chair for back pain loosening muscles and restoring its natural posture. Evolved 3D massage Technology Computer Body Scan 2 Stage Zero Gravity Arm Air Massage Auto Recline and leg extention Accupoint Technology Dual Foot Roller Massage Low Back Heat Therapy Shoulder Lumbar Hip Squeeze Twist MP3 Connection Auto Leg Scan Arm Hand Massage Calf Foot Massage Available Colors Red Black Brown Cream Features Evolved 3D Massage Technology The next generation of 3D massage rollers are designed for outstanding range and flexibility. The 3D technology allows the user to control the length of rollers that extend out from the backrest. From the original start position the massage heads can extend out up to 8 cm delivering an extremely deep tissue massage Computer Body Scan Equipped with the latest 3D technology it allows for the rollers to map each unique back curvature with even more accuracy which translates into a more precise massage hitting all the key areas. Regardless of your body type this highly advanced chair is made to fit your frame which makes each massage experience feel customized. 2 Stage Zero Gravity Inspired by NASA technology the Zero gravity position is the perfect position to enjoy a massage aligning your back relative to your thigh at an optimal level of comfort. When reclined into the zero gravity position the complete weight of your back is virtually supported by the backrest which maximizes the intensity of the massage. This feature improves spinal decompression and decreases muscle tension of the spine. There are 2 stages of zero gravity the 2nd being more reclined. When reclined fully to where your legs are higher than your heart level the therapeutic effects are incredibly effective and may be felt immediately. Next Generation Air Massage Technology Osaki has re-engineered and has developed the next generation of air massage technology streamlining the air massager to a lower count. Through innovative engineering we have reduced the total number of air bags but have increased the volume and surface area of massage. By doing so the total number of working valves has drastically reduced from prior model. Which ultimately puts less stress on the chair making it one of the most mechanically sound massage chairs in the market. Arm Air Massagers Along with mechanical advancement the material has also made upgrades such as the arm massaging area. Using a durable spandex the bottom portion of the arm massager has been lined with small rubber bumps to invigorate the senses as the air bags compress the tops and bottom of the forearm and hands Auto Recline and Leg Extension This chair defines luxury fully automatic to make every movement effortless. The simple to use remote control allows you to operate the foot extension leg rest recline of backrest and the zero gravity position. LED Chromotheraphy Lighting The OS-3D Pro Cyber comes with mood setting LED lights. The cool tone LED lights are hidden behind a metallic plexi-glass and is only visible when activated. In a dark room setting the LED light will cast a cool blue color on the surrounding walls creating a relaxing atmosphere. Accupoint Technology You have approximately 350 accupoints in your body with nearly 100 in your back and neck alone. Select one of six soothing massage types starting from palm style Swedish combination deep tissue kneading and shiatsu. The OS-3D Pro Cyber massage chair has a variety of techniques to target the acupoints with incredible accuracy. Lower Back Heat therapy Placed in the lower back region of the chair are 2 heating pads that enhance the massage experience and more.... see below Why Buy a Massage Chair Your Investment with Great Returns - Buying a massage chair seems to be a big purchase at first but consider the expense your time and efforts taking trips to massage therapists. You can enjoy a massage right at your place when you have spare time. Therefore with the help from us at Titan Chair we will make sure you choose the correct massage chair. Your Convenience Health and Well-being - With high quality massage chairs your body will be better relaxed and be much healthier. Many people testify some of their chronic symptoms or pains are decreased after experiencing a high quality massage chair. Also many chiropractors are recommending a quality massage chair for back pain loosening muscles and restoring its natural posture. 3D Massage Technology 2 Stage Zero Gravity 2nd Generation S-Track Accupoint Technology Computer Body Scan MP3 Player Connection Waist Airbag Squeeze Auto Leg Scan 6 Airbag Seat and Hip Massage Shoulder Heating Upper Shoulder Massage Foot Calf airbag Massage Features Evolved 3D Massage Technology Experience the most humanlike massage from Osaki. The newly enhanced 3D massage designed to massage wider and deeper than the conventional massage rollers. The 3D technology allows you to extend out the massage heads up to 8 cm for an intense deep massage. The 3D intensity has 5 different levels ranging from mild to strong. With the 3D technology reaching and massaging the acupuncture points becomes effortless with accurate precision and depth leaving you revitalized 2 Stage Zero Gravity Introduced by NASA more than 2 decades ago the zero gravity position is a relaxing and stress-free position on your body minimizing the pressure along the back and spine region. There are 2 stages of zero gravity the 2nd being more reclined. When reclined fully to where your legs are higher than your heart level the therapeutic effects are incredibly effective and may be felt immediately. 2nd Generation S-Track The massage track is designed to contour the human back more than ever and to enhance the movement of the massage heads with better accuracy. Accupoint TechnologyOsaki OS-3D Pro Dreamer Massage Chair You have approximately 350 accupoints in your body with nearly 100 in your back and neck alone. From the soothing palm style massage of the Swedish massage to the deep tissue kneading of the shiatsu style massage the OS-3D Pro Dreamer zero gravity massage chair has a variety of techniques to target the acupoints with precise accuracy Computer Body Scan GPSOsaki OS-3D Pro Dreamer Massage Chair The 3D point navigation system uses the pressure sensor technology that virtually maps your back up to 200 sq. inches for ultimate massage accuracy and efficiency. The 3D Zero gravity system scans your back and delivers a massage that contours the unique spine curve of each individual user of the chair. The floating massage heads glide over your back knowing exactly which area to target. MP3 Player Connection To enhance your massage experience the chair is equipped with a built in mp3 connection so you can play your favorite music on quality speakers located by your ears for a direct clean sound. Both volume and song selection can be controlled directly from your mp3 player. Waist Airbag SqueezeOsaki OS-3D Pro Dreamer Massage Chair 2 airbags on each side of the waist area inflate squeezing the waist and massaging that region. When inflated the airbags will not only massage the sides of your back but also position you more firmly in the chair allowing for a deeper massage from the back. 6 Airbag Seat and Hip Massage In the seat and hips are 6 airbags that inflate squeezing the hips inwards. The soft air stimulation works on the thighs by stretching the muscles Foot Calf Airbag Massage Multiple air bags are located on the top and bottom that inflate to apply a compression massage along foot and calf areas. and more.... see below Why Buy a Massage Chair Your Investment with Great Returns - Buying a massage chair seems to be a big purchase at first but consider the expense your time and efforts taking trips to massage therapists. You can enjoy a massage right at your place when you have spare time. Therefore with the help from us at Titan Chair we will make sure you choose the correct massage chair. Your Convenience Health and Well-being - With high quality massage chairs your body will be better relaxed and be much healthier. Many people testify some of their chronic symptoms or pains are decreased after experiencing a high quality massage chair. Also many chiropractors are recommending a quality massage chair for back pain loosening muscles and restoring its natural posture. 3D Massage 12.5cm - the deepest so far 9 Stages of Strength Adjustment Double Sensors for Shoulder Double Heater 16 types Kneading Stretch Massage Triple Mode Air System 7 min course 12 types auto course Available Colors Black Brown Cream Features 3D and 9 Stages of Strength AdjustmentMassage Chair Made in JapanMassage Chair Made in Japan Release your stress with Osaki Japan Premium 4.0 in-depth 3D massage technology. The projection is 4.9 inches which is the industry s latest maximum Double Sensing SystemMassage Chair Made in JapanMassage Chair Made in Japan Osaki Japan Premium 4.0 is lodaed with double sensing system of S Shape detection for spinal line and Shoulder position detection for shoulder. This will optimize the depth and points of massage Double Heater SystemMassage Chair Made in JapanMassage Chair Made in Japan Osaki Japan Premium 4.0 is lodaed with double heater system that warm shoulder baldes and sole of feet. Those area of body tends to be more stiff and chilled. Triple Mode Air System Air massage technique in Osaki Japan Premium 4.0 gives you triple modes - pluse normal and Hand Kneading. Flow Adjustment Function made it possible to have hand kneading mode which provides comfortable consistency of air massage and more.... see below Why Buy a Massage Chair Your Investment with Great Returns - Buying a massage chair seems to be a big purchase at first but consider the expense your time and efforts taking trips to massage therapists. You can enjoy a massage right at your place when you have spare time. Therefore with the help from us at Titan Chair we will make sure you choose the correct massage chair. Your Convenience Health and Well-being - With high quality massage chairs your body will be better relaxed and be much healthier. Many people testify some of their chronic symptoms or pains are decreased after experiencing a high quality massage chair. Also many chiropractors are recommending a quality massage chair for back pain loosening muscles and restoring its natural posture.